Accessory mounts are not the sort of traditional item that VO is known for, but many folks love them. This Dajia mount is such a clever design that we just had to import it. 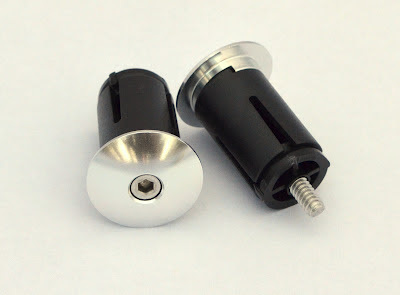 The mounting bolts replace the face plate bolts on threadless stems. 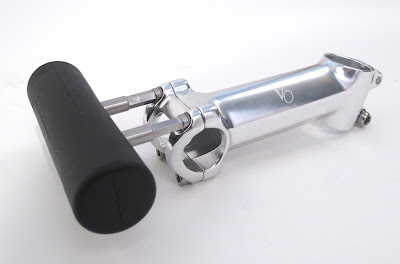 Since the width of the 5mm bolts is adjustable, it will fit VO stems and probably most others as well. 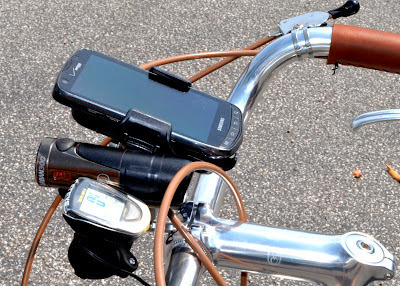 Mount your phone, computer, light, etc, without using up valuable handlebar space. If you'd like something more traditional on your bars, consider a couple of water bottle cages mounted on our handlebar mounts. Using the retro cages gives it a 1940's or 50's look. 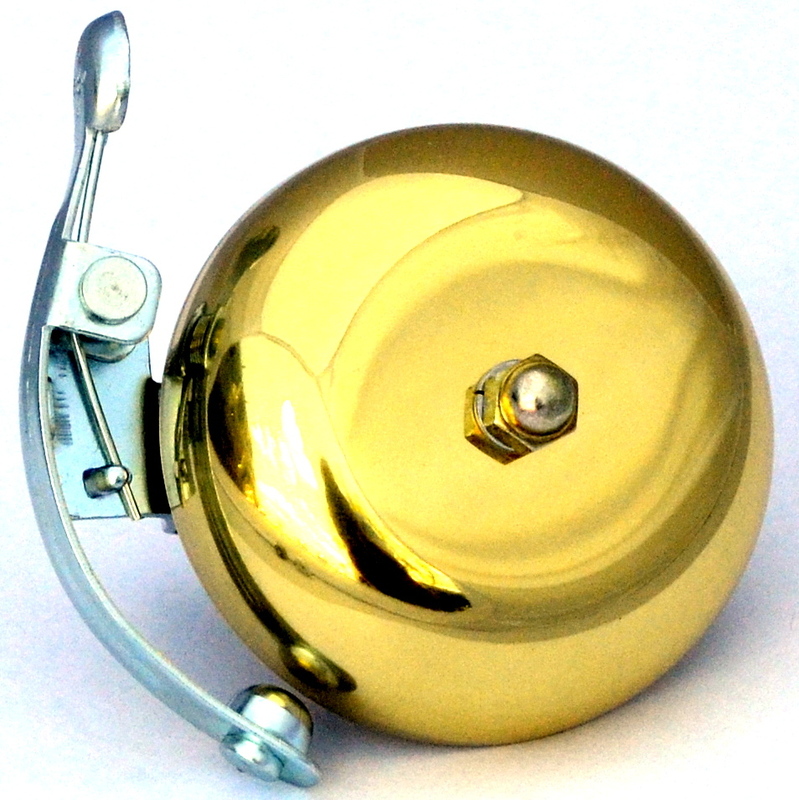 Finally, we have the brass striker bell that many of you asked for. It's a little bigger and louder than the lovely temple bell. I might be a bit obsessed with bar plugs. I've probably ordered samples of 20 models over the past few years, and darn few met my standards. I'm a big fan of Velox plugs, but they can look a little clunky on a fast bike. Plastic plugs all look really cheap to me, even the lock-in type. Actually, there was a really high quality lock-in soft plastic plug made by Milremo, but those are long out of production. I'm still sad that I can't find my last pair. Wooden bar plugs look nice, but can fall out if not installed with great care. These are my current favorite bar plugs. They even replaced the Velox plugs on my Pass Hunter. They are made of polished and anodized aluminum alloy and have a resin expanding wedge thing, so they lock securely into the bar. I like the low profile look and smooth dome shape, clean, simple, and durable. They are easily removed so they can be replaced after you re-wrap the bars, or moved to you new bike. At $9 a pair the price is right, especially so since they'll probably last forever. We currently have them in silver, black, and brown. If they sell well we'll probably add some primary colors. We can have them made in any color, but the minimum production run is pretty high. Any ideas for new colors? The model we stock now is for 23.8mm (road-diameter) bars, but we might get some for 22.2mm bars in the future. Never thought I could write this much about bar plugs. Looks like we have a lot of work ahead of us...Enjoy! I’m a big fan of the way cork grips feel and look. Naturally, I wanted to use them to build up a Porteur bike. Not only are the grips comfy and inexpensive, but they also hold up very well to the elements. To get the classic look of a Porteur, inverse brake levers are always a good choice. 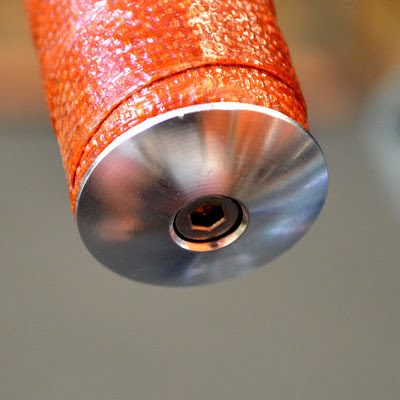 Here’s how to make a cork grip compatible with inverse brake levers. BEFORE mounting the grip, you need to create a channel for the brake housing. Be very careful in this step not to cut all the way through the grip - cut slowly and deliberately. Cut the grip down its length at a 45 degree angle. Cut again at the opposite 45 degree angle. Take the sliver you just cut out of the grip and mount the grip on the handlebar. For tighter fitting bars, you may need Simple Green or hairspray to mount the grip. These items will evaporate and keep the grip stuck in place. Make sure the grip is as far as it will go on the bar for the next step. Take your hammer and start smacking the end of the grip until it starts to develop a cut. Go around the end of the handlebar until you have a chuck of the grip end cut out. Hang onto the chunk for next couple of steps. Mount the brake body, cable, and housing even with the line of the cut made earlier. The channel and housing should be facing the ground. Grab your waxed thread and start wrapping the front of the grip (opposite from the lever body). Tie the end of the thread in a couple knots, push the thread together, and you’re done! Bonus points if you can get the cut ends under the wrapped thread. Stick the grip chunk you saved and stick it in the end of the body if your lever needs a plug. You may need to cut a wedge off to make sure it doesn’t interfere or fall out during the actuation of the brake. Last year, while doing a weekend tour of Maryland’s beautiful Eastern Shore, I stumbled across a small shop in Cambridge, MD, On the Rivet Cycle & Sport. I stopped in for a bit and chatted. Not only did they have unique bikes from almost every era, but they also had a few custom leather wraps. 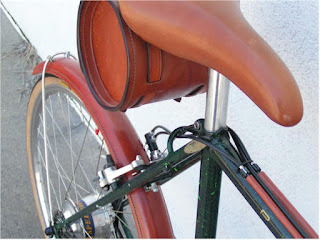 When you think of leather wraps, you think of handlebars, right? 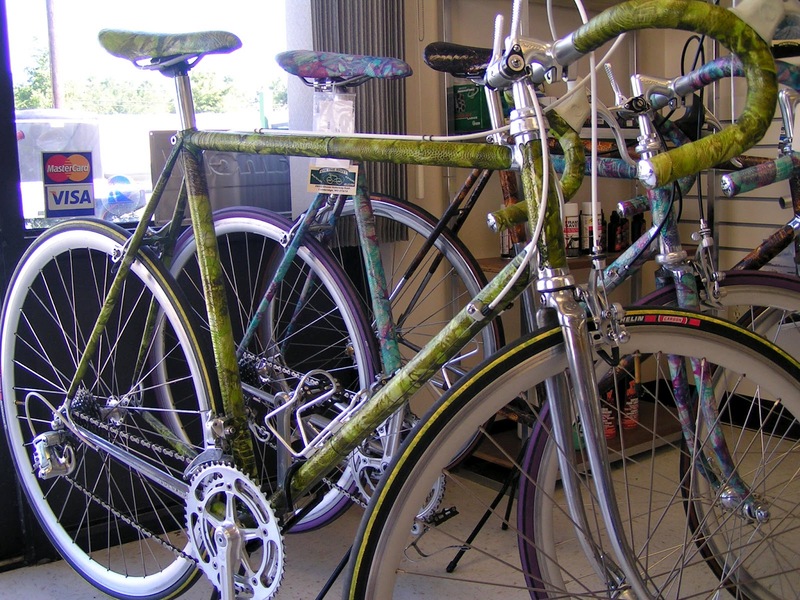 Yea, those were wrapped, along with the frame, saddle, stem, fork, and in some cases fenders. Definitely not something you see on a grocery getter! So fast forward a year, I stopped back in to the shop and had the pleasure of speaking with Matt Beletsky about the work his father Bob Beletsky does with leather wrapping. Bob has been the leather industry for more than 35 years and even opened up his own leather business, Chesapeake Leather Works, but his real passion is tinkering with classic/vintage bikes. Naturally, his bike hobby and leather talent came together to create some bikes that are completely unique. 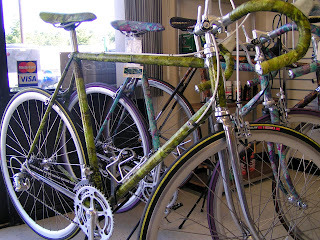 Matt showed me a 1983 Pinarello with one of Bob’s signature wrappings. Made out of custom dyed Ostrich leg, Bob cuts the leather into strips and then uses leather glue to adhere the leather to the frame, all the while cutting very precisely around the lugs. The painstaking work continues for the rest of the tubes and fork blades. The handlebar features a more traditional wrap with custom stitch work. To cover the fenders, Bob uses an antique turn of the 20th century sewing machine with an integrated auger to get through the hard metal and then pass thread. The end result is a 100% unique, fully functional frame that can be ridden everyday with very little maintenance (just apply some saddle care). In addition to the leather wrapped bikes, the vintage and high-end bikes, the shop had a Houdaille bike that features a pre-Biopace crankset of sorts. Using a cam/bottom bracket combo, it eliminated the dead spots on the 60/45 tooth chain rings. Sounds like a good idea... maybe we should get Casey on that? Cantilever brakes have stood the test time of time due in a large part to their simplicity. They provide ample tire and fender clearance, and once properly, set up require little maintenance. Unfortunately, getting them properly set up can be challenging. Our cantilever brakes, the Grand Cru MK2 and the Grand Cru Zeste brakes, are designed with extra features to make their setup easier. 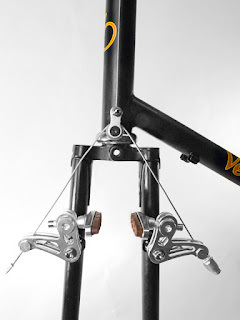 While this blog post is intended to provide a basic understanding of how to set our brakes up specifically, the theories apply to most other cantilever brakes. Mechanical advantage: This is the ratio of the “force out”, at the pads, to the “force in”, at the brake lever. An important thing to remember is that energy is conserved. Mechanical advantage can also be looked at as a trade off between force and distance. A higher mechanical advantage corresponds to a larger output of force at the brake pads, but means a smaller distance traveled by the brake pads. Energy is going to be lost from your braking power due to housing flex, cable flex, cable friction, and plenty of other things. This is another great thing about the simplicity of cantilever brakes. There should be an extremely small amount of flex in the brake arms, therefore less energy lost. The same thing certainly cannot be said for a lot of long reach caliper brakes. It is possible to have too large of a mechanical advantage, because the larger your mechanical advantage is, the smaller the range of motion of the your pads will be. This would mean needing to have your pads very close to your rim and not being able to release your brakes. 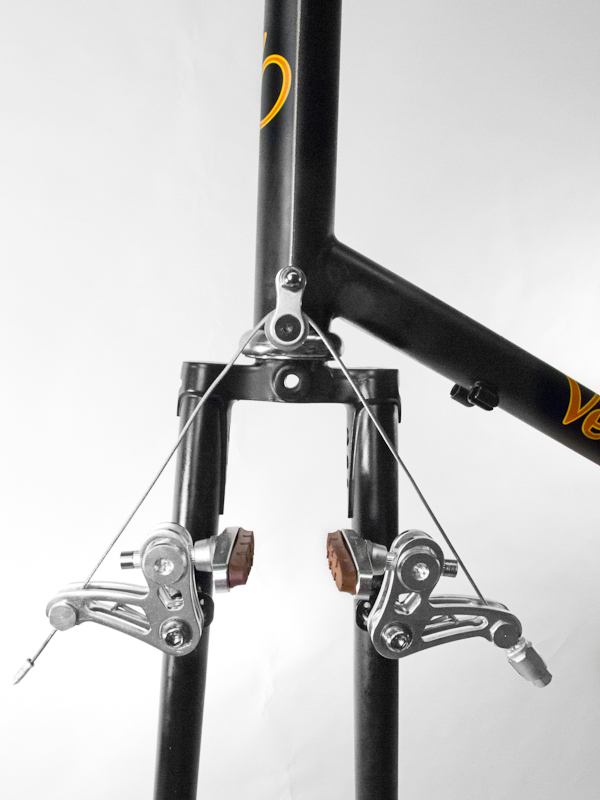 The primary adjustment of mechanical advantage on cantilever brakes is the straddle cable yoke height. For our brakes, the lower the yoke height the higher the mechanical advantage. Cantilever Brake Types: There are two main variety’s of cantilever brakes on the market today, wide profile and low profile. Wide profile cantilever arms stick out from the frame, often close to horizontally, while low profile arms point toward the sky. Wide profile cantilevers have a simple setup and fairly consistent mechanical advantage. 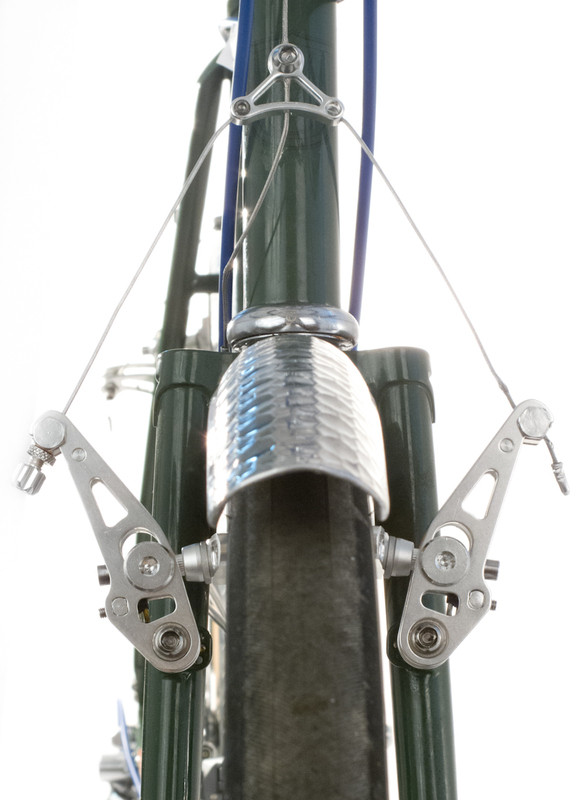 Low profile cantilever brakes are useful for pannier or heel clearance on small frames and provide access to a larger mechanical advantage. However they are generally harder to setup well. We make both types, the Grand Cru CantileverMK2's are our wide profile model, and the Grand CruZeste are our low profile model. Properly set up, brakes should feel a bit squishy. This generally means that you have enough mechanical advantage that you're compressing the brake pads. This isn't a perfect indicator because if you have a lot of brake housing that is going to make your braking feel squishy as the housing compresses. When setting up brakes in the bike stand, the temptation is to set them up so they feel stiff. This intuitively seems like it would correspond to the most braking power because it makes the brakes seem more responsive. However, remember that a low mechanical advantage means more pad travel. This feeling of responsiveness is coming from the higher pad amount pad travel, and actually means that your mechanical advantage is too low. There is a handy interactive calculator made by Benno Belhumeur that allows you to adjust different cantilever brake parameters and see how they effect mechanical advantage. For those of you who enjoy things like that. 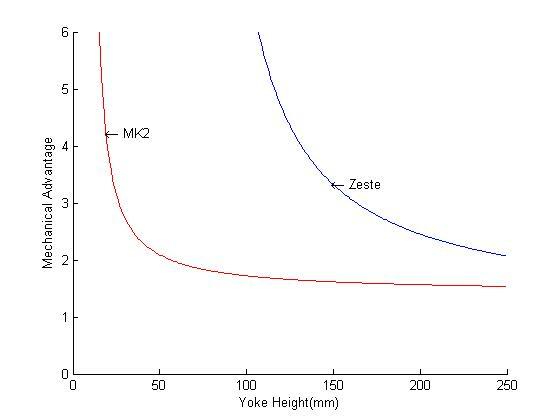 The above picture shows mechanical advantage vs. yoke height curve for our brakes. (Yoke height is measured from the brake studs). Note that this is the mechanical advantage of the brakes only, it ignores the MA of the brake lever. As you can see, the MK2's will give just about the same mechanical advantage no matter where you the put the yoke. A 100mm yoke height is about as low as your going to be able to get. The Zeste brakes have a much larger accessible range of Mechanical advantage. This is part of what makes them tricky to properly set up. What we generally suggest is to set the yoke height at about 6 inches(150mm) from the brake stud as a starting place. Then adjust the yoke height based on feel, remembering that a lower yoke height corresponds to a larger mechanical advantage. The other problem with the mechanical advantage varying so much based on yoke height is that yoke height is going to increase as the pads wear. For this reason we have a barrel adjuster at the end of our straddle cables. This means that you can easily tighten your straddle cable as your pads wear. On our brakes it is also possible to adjust the brake pad post, bringing the brake pad closer in or further away from the cantilever arm. For the low profile brakes this adjustment will make a small difference in mechanical advantage. On wide profile brakes the mechanical advantage can substantially decrease as you move the pad away from the cantilever arm. For this reason we suggest backing the post all the way out so the pad is as close to the cantilever arm as possible on wide profile brakes. 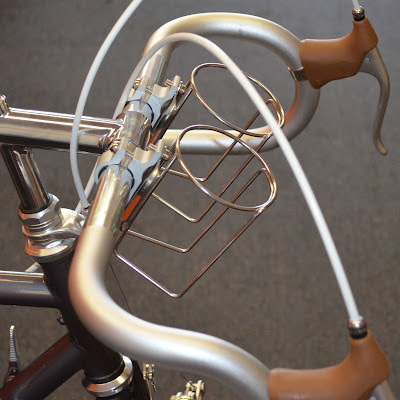 So you can see how a simple design like the cantilever brake can have a multitude of ways in which it can be set up and why proper set up can make a huge difference in the performance of the brake.